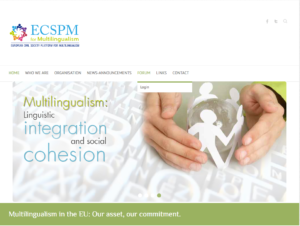 The European European Civil Society Platform for Multilingualism (ECSPM) is an alliance for languages and multilingualism in Europe, making possible the cooperation between European, national, and international networks, organisations, federations and associations that view multilingualism as an asset for European economic, social, cultural development, and as a facilitator for intellectual growth, social, and personal development. It aspires to be a strong voice of Europe’s civil society, promoting language policies for multilingualism in all aspects of social life by way of focusing on people, and on their ability to use a variety of semiotic resources to access education, social affairs and culture, to participate as active citizens in the EU, shaping its making, benefitting from better communication, wider employment and business opportunities. To achieve these aims, it intends to raise further awareness about the EU’s linguistic resources, and get underway intercultural dialogue, to continue drafting policy documents with which to advise the European Commission and EU Member States, and to provide council on how to implement relevant policies effectively. Most importantly, it intends to ensure that the right of all students to learn two languages in addition to their mother tongue is respected, and that Europe’s rich linguistic and cultural resources are maintained, as they are viewed as crucial for the future of Europe, its economic development, and its political integration.